There have been a lot of changes going on with my normal routine lately. Since purchasing a house and moving out of a tiny apartment, I’m now living 45 minutes from the beach instead of 25 minutes. Regardless though, a little extra distance isn’t enough to keep me away from something I love so much. California’s coast is undoubtedly some of the most beautiful scenery in the world, and I’m on a mission to photography it all, from San Diego on the south end to to Pelican State Beach below the Oregon border. Before moving further from the beach, I crammed as many seascape sessions as I could onto my calendar because I knew it would take some time to get settled into the new place and my opportunities to get out to the beach would be inconvenient until my life settles back into what you could call a normal state. On this evening I continued my trek into south Laguna to a little place called Table Rock Beach. Some photographers guard their photo locations like it’s the holy grail, which I think is freakin’ absurd. I could care less about my secret spots getting “exposed”. This beach is located off of Table Rock Drive and Pacific Coast Highway. You won’t find it on the map when searching for Table Rock Beach, but I assure you it’s there and there are signs at its entrance to let you know you’re in the right place. Don’t bother trying to park on Table Rock Drive. You’ll need to park on Coast Highway and walk. 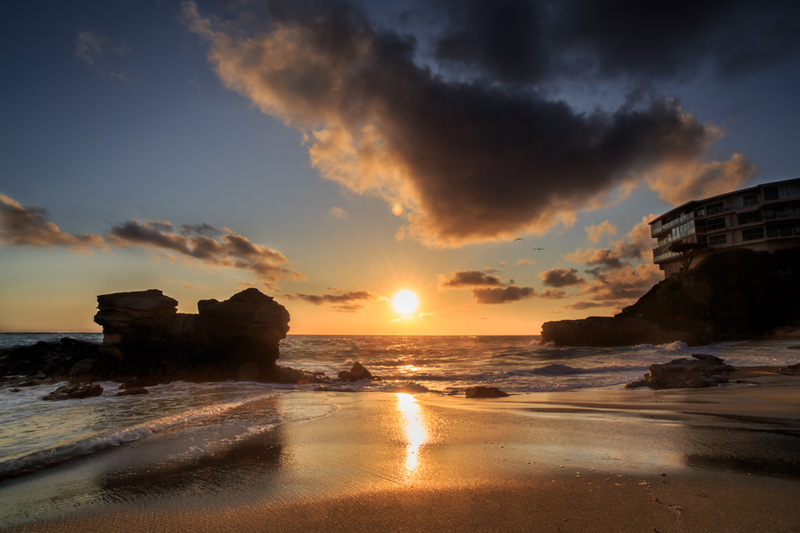 Like many beaches throughout Laguna, there are a lot of steps you need to go down (and unfortunately back up) to get to it. Be sure you’re in good shape before going because your legs are going to thank you for this, and by thank I mean scream what the heck were you thinking, by the time you get back up to your car. Surprisingly, this is the first shot I fired off that evening. After I loaded my photos from this session into lightroom, I briefly glanced at the others and rejected the whole rest of the set. This was supposed to be my initial test shot to see what settings I wanted to use and I nailed it on the first try. All I did was I mounted my reverse graduated neutral density filter onto my lens, set my aperture to f18 to capture the sun star, and fired off a shot at 1/60th of a second. Later that evening the cloud formations mostly disappeared making the available light and the sky look rather dull. Photography is so much about being in the right place at the right time that it makes the camera gear secondary. You can have the most expensive gear money can buy but if you don’t put yourself in front of beautiful scenery, you’re still going to capture dull photographs.